A cruiser sails off Poros. hoped he would survive to see another night. One of the pleasures of bareboat chartering in the Greek Islands is that the history of ancient civilizations is everywhere you look, anywhere you moor. Greeks, Romans, Persians, Turks—this is the land of Homer, Aristotle, Plato and Sophocles. In an amphitheater built more than two millennia ago, we stood on marble steps worn smooth by the sandals of the toga-clad men who conceived philosophy, law, mathematics and astronomy, indeed, the very civilization that we now know. On another day, we moored in the shadow of the oldest maritime academy in the world in a harbor from which the Greeks once rowed into battle on triremes. 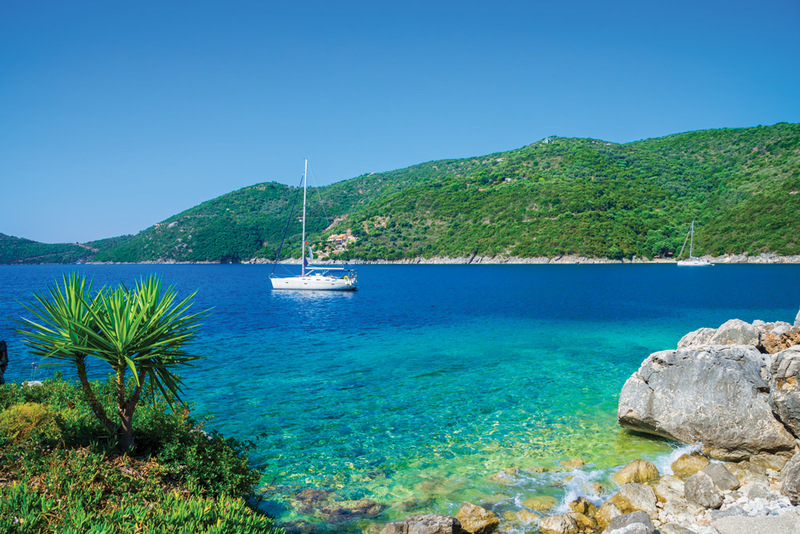 Bareboat chartering in Greece is an irresistible opportunity to explore centuries of legends among the Saronic Gulf islands that are close to Athens, yet a world apart. For our time machine, we chose a Jeanneau-built 36-footer from The Moorings. Aside from the boat, the most important decision we made was to hire a captain. Unfamiliar with the waters and dealing with a language that was literally Greek to us, it proved to be a wise choice. We flew into Athens and, after a traffic-clogged taxi ride, arrived at the charter base to find it closed. As we stood wearily with our bags, a motorscooter zoomed up. With a courtly bow, the rider greeted us in perfect English: “Hello! I am your captain, Thrassos.” In moments we were tucked aboard our boat and Thrassos was showing us where he had stowed the provisions we ordered, pointing out the cold drinks and a pile of fresh linens, and leaving us to sleep off our jetlag. appeared. Did we need more water? A hose was connected in an instant at a price far below tourist rates. He pointed out wonderful local restaurants unsullied by tourists, gave us a running lecture on island history, and showed us his private swimming coves. Not only was he a charming companion but, when we returned from exploring ashore, it was to a boat that had been washed down and polished. Best of all, he handled the sometimes tricky Med-mooring process with a practiced certainty. And, with a captain, there is no insurance or security deposit. 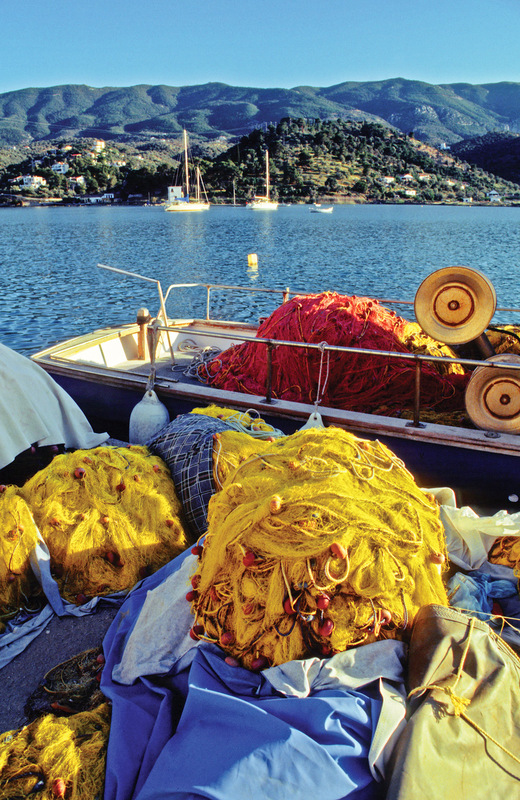 Experienced Caribbean charterers will find the Greek islands different for several reasons. First, there aren’t as many coves so you’ll spend most nights tied stern to the quay in a small village, where you’ll shop for fresh food daily rather than stock up in advance. Second, the terrain is different, with silver-leafed olive and cypress trees covering the rocky hillsides along with groves of fragrant lemon. Because of the antiquities, scuba diving is restricted to certain areas and snorkelers won’t see tropical fish, but they may catch a glimpse of an ancient vase (amphora) untouched for thousands of years. Distance between the islands is short, and we chose the tiny fishing village of Perdica on the island of Aegina for our first night. We were just 20 nautical miles from Athens, yet the whitewashed buildings and winding streets were ageless. The Greeks have four names for the west wind but, whatever they call it, there was no lack of it that night. Tucked behind the quay with the fishing fleet, we spent a rolly night and were ready to leave early for Poros, just 12 nautical miles away.